The internet is all a-twitter over Google Wave. In the development team’s words, it’s “an online communication and collaboration tool that makes real-time interactions more seamless”. In other terms, it’s an online conversation (like an instant message or email) that can be edited and added to by anyone invited to do just that. It incorporates photos, wikis, and elements of social media, all with the intention of changing the way we communicate online. Google sent out 100,000 invitations to a select group of beta testers on September 30, and is expected to be launched for public use in 2010. Everyone’s excited to see how this ambitious project will turn out, and if it can fulfill its promise of being the next vanguard of collaboration and social media. Marketing Breakthroughs’ handsome and opinionated writers took to their keyboards to debate whether it will, in fact, change the way we communicate online. 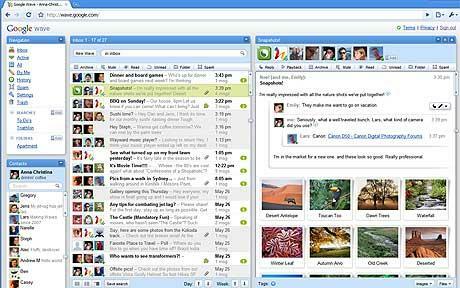 Google Wave seems built for the web’s futuristic power user. It’s complicated to say the least, and it’s unlike anything we’ve seen before—and that’s a bad thing. While some web apps can be explained in a single sentence, for instance: ‘Facebook helps you connect and share with the people in your life,’ it took a team of developers an hour and twenty minutes to explain all its features and how they work to some of the world’s most knowledgeable web users at a recent conference. Wave seems to go against two current web trends: Twitter—simple, fast, short communication, and audio/video conversations—why text chat when you are able to simply talk? Rather than simplify an online conversation, Wave seems to create a whole new monster. We have Google Documents, yet everyone still seems to email our Word docs to one another. Why reinvent the wheel? Finally, Wave will use the HTML 5 coding standard – not currently supported by the world’s most popular browser: Internet Explorer. So when you ‘wave’ to somebody, will anyone be there to wave back? I think not. It’s pretty safe to say that when e-mail was first introduced (over 30 years ago!) that sooner or later someone was going to have to come along and recognize the shortcomings of this prehistoric form of communication and change it. And who better to do it that Google? Why hasn’t there been a holistic solution that combines all forms of social media and email together? Millions of people have embraced the interfaces of social media. For example, if Facebook were a country, it would be the 3rd largest country in the world! The visual interface, the photo sharing, link sharing, fan groups, event communities, etc. has been embraced by the masses. It has become normal for people to communicate using these methods, and its more interactive than email. Google already controls so many of the great things people use online (search, maps, docs, and email). Currently we access these things individually using separate applications. Combining these elements and opening up mass conversations between friends, rather than one-on-one communication, will change the way we think, speak, and interact with the people we know. For all those who argue “it looks too complicated”, I hope you remember that in the past, every online innovation has had a little bit of a learning curve. Google Wave will be no different. The results will change the way we communicate.